Encouraging people to take fitness classes or join a gym is good, but many experts believe the best way to get people to exercise is to make physical activity part of the daily routine: walking to school, biking to work, strolling down to the post office. Whether a town is set up for that—with plentiful sidewalks, crosswalks, bike lanes, shade trees, and shops and businesses you can reach without getting into the car—can make a big difference. That’s why the Friedman School created a course called Policy, Systems, and Environmental Change for Physical Activity, taught by Mark Fenton, a public health planning and transportation consultant, and Rebecca Boulos, NG13, executive director of the Maine Public Health Association. 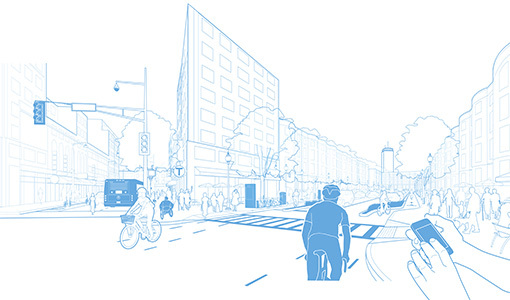 The course, offered through the Online Graduate Certificate Program, shows students how to assess what their communities need and then advocate for smart changes to the built environment. Here are a few of the ways graduates are putting what they learned into practice. CONNECTIONS A new paved path will make it safer and easier for people to walk across Medford. It will also link up two of the city’s business districts. Not long ago, Jen Valentyn noticed an odd path-to-nowhere near her son’s middle school. You could theoretically follow it to a waterfront park—if you hopped a fence and maneuvered through some private property. The only other way there meant dodging cars on one of Medford’s busiest roads. 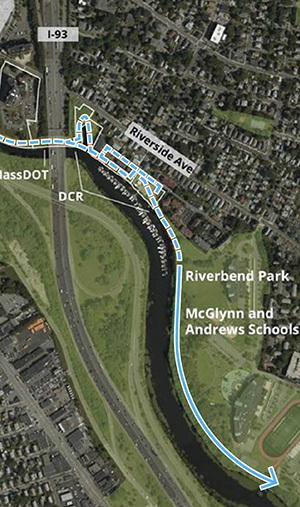 Thus began her campaign to create the Clippership Connector, a paved half-mile path that will provide a new way for kids to walk or bike to school, as well as connect two large waterfront recreation areas and two of the city’s main business districts. Commuters will be able to bike all the way from Somerville to Boston. 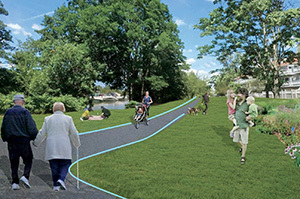 GREEN SPACES Residents of all ages will be able to use the path or recreation and commuting. Valentyn, a volunteer with a grassroots group called WalkMedford, is one of many residents working to make the city’s built environment more conducive to physical activity. On some streets, they advocate for repainted crosswalks, new bicycle lanes, and curb extensions that jut into intersections, slowing traffic and making it easier for people to cross. On others, they want to see benches, updated bus shelters, and bike racks. To spiff up a highway underpass, WalkMedford applied for a grant and is picking an artist to create a mural. “There are literally hundreds of problem areas that we are trying to fix,” Valentyn said. Taking the course with Fenton and Boulos gave her practical ideas for how to approach city officials and work with reluctant neighbors to get things done. Construction is slated to begin in 2018. 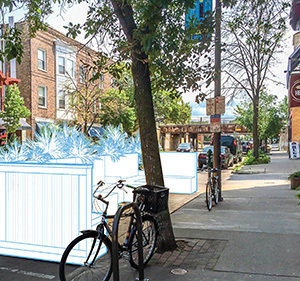 REST STOPS Parklets repurpose parking spaces and turn them into urban oases for walkers and bikers. Drivers often don’t have much appreciation for cyclists and often don’t even want to consider bike lanes—especially if they mean losing on-street parking spots. To get the conversation started in her hometown of Wilmette, Illinois, Anne Nagle employed a new kind of demo: the pop-up bike lane. 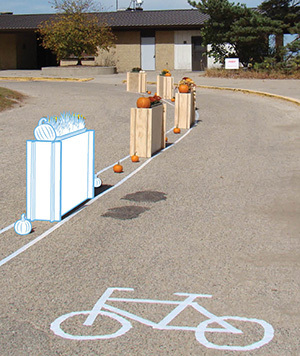 POP-UP To introduce residents to the idea of protected bike lanes, Anne Nagle used planters and pumpkins to set up this temporary demo at a community event. With a grant, Nagle bought traffic cones, stencils for painted lines, and collapsible planters that serve as a protective barrier. She then set up the temporary lane and invited people at a community day to try it out. “This bike lane is about you and me, people eight to eighty,” she explained. “It’s for all of us and our children as we get older.” Many saw that the lanes were more useful than they thought. 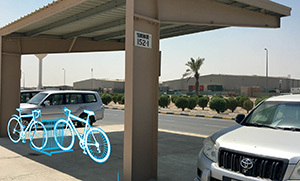 SHADE Shelters will keep bikes cool in the desert sun. Lt. Col. Angela Greenewald, a 22-year veteran of the Army, has long been interested in health. Looking toward a postmilitary career in nutrition, she enrolled in Fenton and Boulos’ course—which she completed while deployed in Kuwait—and realized how much the environment influences our behavior. The class gave her a chance to take a hard look at how her environment—Camp Arifjan in Kuwait—affects the health of her soldiers. LANES A dedicated route for bikes will help military personnel safely navigate the camp.